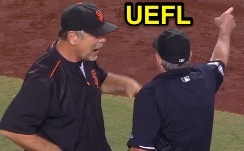 HP Umpire Mike Winters ejected Giants Bench Player Jake Peavy and Manager Bruce Bochy for arguing a strike three call in the top of the 7th inning of the Giants-Dodgers game. With one out and two on, Giants batter Alejandro De Aza took a 2-2 changeup from Dodgers pitcher Zack Greinke for a called third strike. Replays indicate the pitch was located off the outer edge of home plate and waist high (px -1.103, pz 2.683), the call was incorrect. At the time of the ejections, the Dodgers were leading, 1-0. The Dodgers ultimately won the contest, 1-0. These are Mike Winters (33)'s third and fourth ejections of 2015. Mike Winters now has 3 points in the UEFL Standings (6 Previous + 2 MLB + 0 Irrecusable Call = 3). Crew Chief Mike Winters now has 5 points in Crew Division (6 Previous + 1 Irrecusable Call = -3). These are the 188th and 189th ejections of the 2015 MLB Regular Season. This is the 84th player ejection of 2015. Prior to ejection, Peavy did not appear in the game. This is the 89th Manager ejection of 2015. This is the Giants' 6/7th ejection of 2015, 3rd in the NL West (SD 15; LAD 8; SF 7; COL 5; ARI 4). This is Jake Peavy's first ejection since August 24, 2014 (Paul Emmel; QOC = Y [Balk]) [also DNP]. This is Bruce Bochy's 4th ejection of 2015, 1st since July 5 (Phil Cuzzi; QOC = Y [Balls/Strikes]). This is Mike Winters' first ejection since May 29, 2015 (AJ Ellis; QOC = Y [Balls/Strikes]).